At St. Albert Honda, we understand the immense importance that working brakes have on your safety. We’re proud to keep you safe by offering Lifetime Brake Pad Guarantees* on genuine Honda replacement brake pads. Every time your Honda’s brake pedal is pressed, material on the brake pads pushes against the brake discs to create friction and slow, or stop, your vehicle. When you use your brake, small amounts of this material wears off, making it necessity to replace. Our dedicated service and parts departments have you covered if this should ever happen to you. If you’re able to find a lower price on tires by any of these brands (Michelin, Toyo Tires, Goodyear, BF Goodrich, Dunlop, Firestone, Uniroyal, Hankook, Yokohama, General Tires, Pirelli and Continental) within 30 days of purchase, at St Albert Honda we’ll match the price you find! 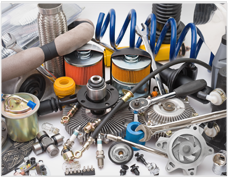 St. Albert Honda offers almost any part or accessory you need for your car, truck, or SUV. Come by and visit us at 875 St. Albert Trail. If you already know what you need, complete our parts order form, and we’ll take care of the rest! *Should you find a lower advertised price within thirty (30) days before or after the purchase of qualifying tires from a participating Honda dealer, present the Honda dealer where you purchased, or intend to purchase, qualifying tires with proof of the advertised price and they will match the lower price. Offer does not apply to quotes or advertised prices from outside Canada, online auction sites, wholesalers, online retailers that have no physical stores in Canada, close out/liquidation/clearance sales, advertising errors or misprints or restricted offers. Subject to stock availability. Qualifying tires must be purchased and installed at a participating Honda dealer in Canada. Advertised item must: (i) be an in-stock brand, excluding Bridgestone, be of the same brand, size, model, sidewall, speed and load rating; (ii) be sold through an authorized retailer located in Canada; and (iii) be in Canadian dollars. Lowest Price Guarantee does not apply to costs associated with labour, valve stems, mounting/balancing, disposal fees and taxes. Some restrictions apply. Offer subject to change or cancellation without notice. Ask your Honda Dealer for details.